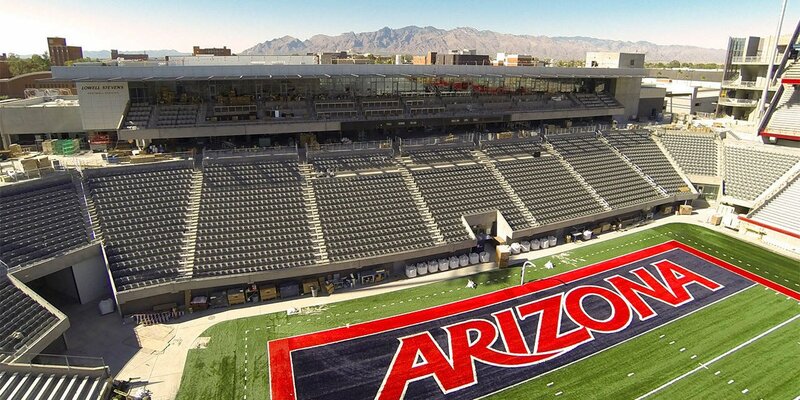 Finished in the summer of 2013, the new north end zone facility at the University of Arizona Stadium added premium seating and fan amenities, a new home for football operations, and new concourses that connected access to the east and west stadium seating sections. Planning for the new 189,000 square-foot facility involved significant logistical coordination as the project site was surrounded by dormitories and an active university environment. In order to make sure student life and the 2012 football season was not interrupted, phasing and shift work was required. 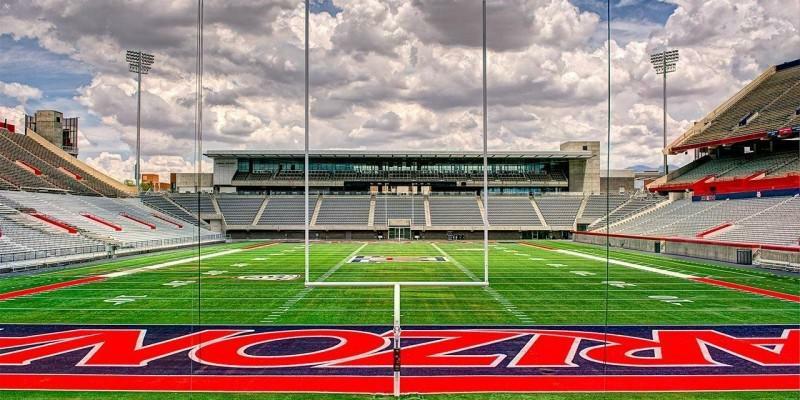 MA Mortenson was selected as the general contractor on the project which was named the Lowell-Stevens Football Facility. They had several goals to meet, including managing a tight project schedule within budget, maintaining the safety of the construction crews and University students and visitors throughout the project, and sourcing the majority of the materials used on the project locally and in a safe manner. Roland Baldos, MA Mortenson's senior estimator for for the project, was in the early stages of estimating work on the project when representatives from the Building Solutions team at CRH reached out and put him in touch with other CRH businesses in area. During early project discussions, Baldos learned about the breadth of products that CRH offered in the area. Due to its location on a campus, there were unique challenges, including limited access roads and construction site space, and high student pedestrian traffic around the area. According to Mike Gamez, general manager at Staker Parson in Tucson, the excellent communication between his and MA Mortenson’s field personnel, and CRH's dedication to ensuring construction site safety, enabled them to keep everyone safe in the cramped quarters. With all of the different products being delivered and installed, often around the clock, at times it looked like a small city. Even when there wasn’t work to be done on a given day, Gamez’s crew would be on site performing safety inspections. After a main water line was installed for the facility, an interference challenge was discovered between it and a section of the block wall. Not wanting to incur the lost time and expense of rerouting the water pipe, CRH masonry experts recommended a solution using an alternate size of block, correcting the issue with minimal disruption. Adding to the challenge was a custom color requirement for the block, which normally would have a three week lead time. Having a single materials supplier on site for a majority of the construction products made it simple for them to reach out to the local plant for guidance on production. CRH was able to turn the product out in a week keeping the project on schedule. To also assist with keeping the high-profile project on schedule, Staker Parson performed night pours and worked around the schedule of the stadium, which was a key factor. Additionally, CRH introduced MA Mortensen to several qualified subcontractors in the Tucson market, including masons and roofers, which also simplified the procurement process and ensured a quality outcome. Having a single point of contact for design support, logistics coordination and product expertise ensured the project goals were met on time by simplifying the procurement process, reducing risk, and improving communication throughout the project. Download our guide to optimizing project scheduling today to see what tips — along with using a single source for your product materials— you can follow to reduce project risk.